Responsive websites have become very important as more and more people are using mobile devices to search the Internet. Almost half of all searches are now run on tablets or smartphones. A responsive website may change size, format or even what is displayed to provide an optimized experience, depending on the size of the screen used to view the website. 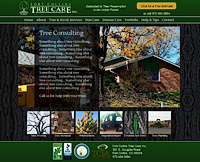 Fort Collins Tree Care is a full service tree and shrub care service. Blue Spruce Counseling provides counseling and coaching for clients in the Fort Collins area. 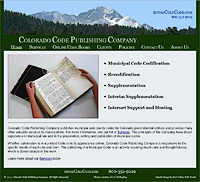 Colorado Code Publishing Company publishes municipal and county codes for governmental entities in Colorado. Corner Coins & Jewelry buys and sells rare US coins and currency, precious metals, and scrap gold jewelry. Fort Collins Muffler and Automotive is a local auto repair shop, specializing in brake repair and exhaust system repair. 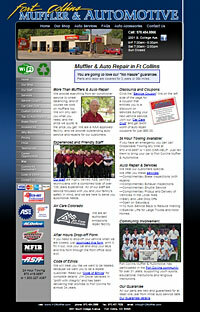 Fort Collins Muffler and Automotive uses their website to describe the services they offer, provide tips, advertise with online coupons, and display some of the testimonials from their customers. The incrediPen can be a valuable tool for people trying to quit smoking cigarettes. Phase Three Product Development designs custom products using microfluidic technologies. If you want to promote a point of view, an industry, or an organization you want a promotional website. Your website might tell viewers how to make donations or where they can buy your items, but its main goal is to inform members of your organization or the public. The Cache la Poudre River brings water from the Rockies to cities along Colorado's Front Range. 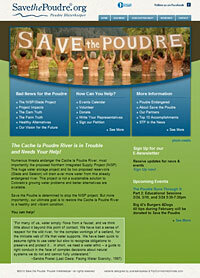 Community members use this website to tell the public about dangers to the Poudre and to help organize everyone to protect their river. 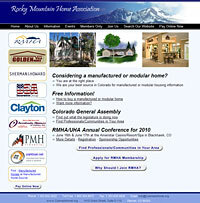 The Rocky Mountain Home Association is a trade association representing the modular and manufactured housing industry. They use their website to advertise their products and keep their members informed about important issues. Golden Prairie Inc. is the premier grower of certified organic millet in the Rocky Mountain West and the largest national distributor of certified organic millet in the US. 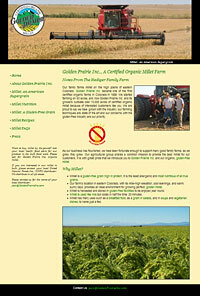 Their website promotes the use of millet with FAQs, recipes and nutritional information. 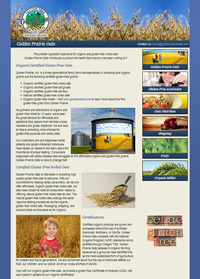 Golden Prairie Inc. wanted a second website to promote a new product line, gluten-free oats. They wanted it to have a similar feel, but be different enough that customers would notice that they were looking at a different product. 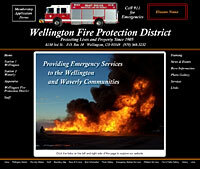 The Wellington Fire Protection District provides emergency services to the Wellington and Waverly communities. 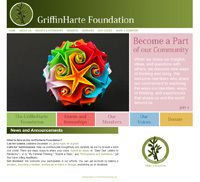 They use their website to provide information to the community and their members. Our real estate websites are like expanded MLS listings that customers can find on the Internet. They include all the important features of the home and neighborhood and many pictures. We will use pictures that you provide, or we will take pictures of your home if wish. A good picture can sell your home. A home for sale website can bring in customers, or remind customers what your home looked like after a day of looking at available homes, or even be a valuable tool for a customer to show to their spouse that wasn't able to go on the house hunting trip. 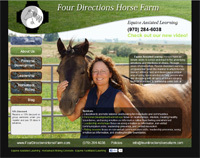 The home owner wanted a one-page website to help sell their custom horse property near Fort Collins. We added lots of pictures, descriptions of the most important home features, and contact information when building their website. 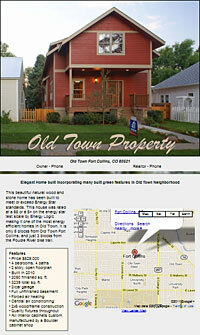 The builder wanted a one-page website showing off his elegant new home in Old Town Fort Collins. We created a website that included plenty of pictures, a few panoramas, descriptions of important features, floor plans, map, and contact information. 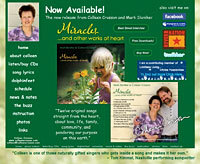 Websites are great tools for musicians. Use your music website to promote your latest CDs or downloads and even sell them directly to your fans, communicate with your fans through newsletters or blogs, and tell everyone when and where you will be performing. Colleen Crosson is a local singer, musician and music teacher. 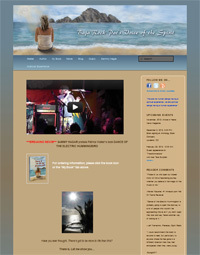 She uses her website to promote and sell her CDs and keep her fans up to date with her schedule and online newsletter. 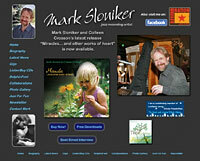 Mark Sloniker is a local jazz musician and entertainer. He uses his website to tell his fans when and where he is performing next, and to promote and sell his CDs. These websites advertise the businesses' products and direct customers to either call the business or visit in person to make purchases. This type of site is more appropriate for selling products that require a customer to inspect them personally, and for businesses that want to talk to their customers to make the sale. 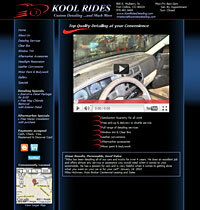 Kool Rides Custom Detailing does minor paint and bodywork, installs aftermarket accessories, and details vehicles. 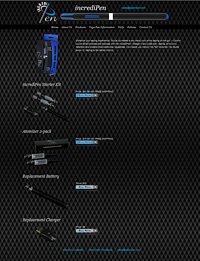 Their website describes their services in detail with plenty of pictures and videos. Fort Collins Photo Works specializes in event photography in Fort Collins. 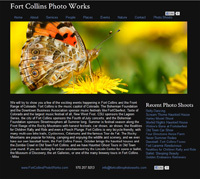 They use their website to show off their images of Fort Collins. We added a slideshow with fancy transitions to the home page and built most of the other pages around simple photo galleries to emphasize the images rather than the website. 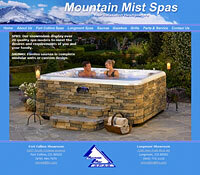 Mountain Mist Spas sells and services spas, gazebos, grills and accessories. They use their website to show off their product lines. 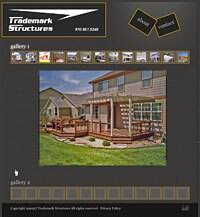 Trademark-Structures Inc designs and builds outdoor structures including decks, decorative concrete, and gazebos. 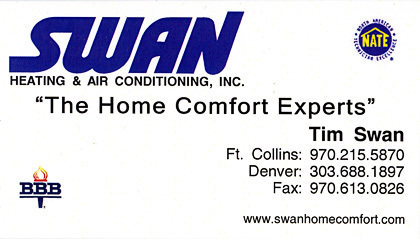 Their website shows off many examples of their work, describes who they are and helps customers contact them. Kris uses equine assisted learning techniques to help her customers develop to their full potential. 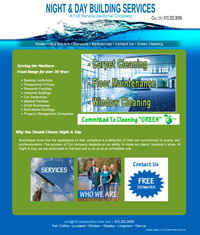 Night & Day Building Services wanted a website to advertise their janitorial services. Country Land and Home sells modular and manufactured homes and real estate. 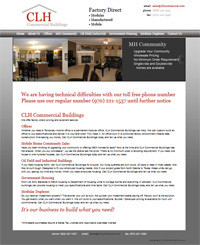 We created a simple website with a slideshow on the home page and descriptions of their homes and services on additional pages. 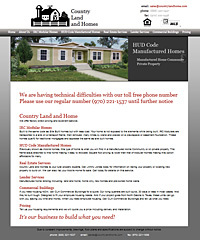 Country Land and Home wanted a second website that concentrated on their commercial buildings. We used the same style on this site to maintain their branding. 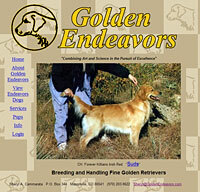 The Golden Endeavors staff are dedicated golden retriever breeders, golden retriever handlers and golden retriever lovers. They use their website to show off their golden retrievers and inform their customers about the status of their upcoming litters. 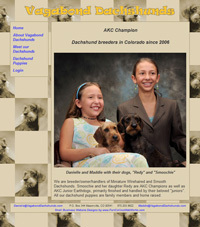 Danielle and Maddie breed and handle wirehaired and smooth dachshunds, and they wanted a website to advertise their puppies. 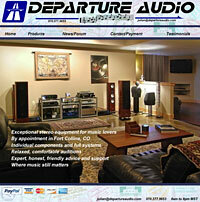 Departure Audio sells exceptional stereo equipment for music lovers, and blog about new advances in stereo equipment on their website. They will even let you test drive their equipment. 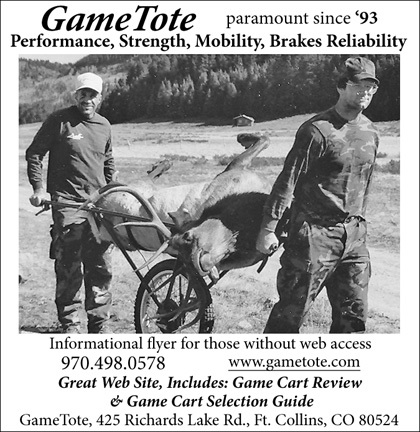 These online stores advertise products and use a shopping cart to take orders from customers. Many of them use PayPal to automatically transfer credit card payments from the customers' credit card account to the store owners' bank account, but a few use payment gateways provided by the store owners' banks. The store owners don't see their customers' confidential credit card information because it goes automatically to the bank, eliminating the store owners' liability. These customers find it easier and cheaper to have us make any changes to their inventory because they don't need to make changes more than once a month. We can usually make the changes within 1-2 days, and the store owner can concentrate on their business instead of how to update their website. 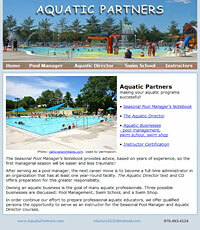 Aquatic Partners serves the pool management industry. Customers can register for training and purchase training materials from their website. 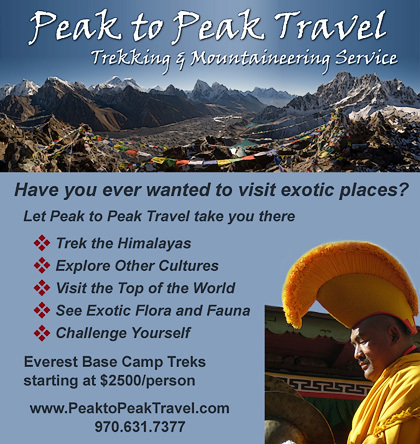 Peak to Peak Travel takes customers on guided treks in Nepal and the Himalayas. They use their website to describe the details of their various treks, their qualifications, encourages customers to sign up for their treks. Bob Swerer Productions creates nature oriented videos like "Ghost of the Forest" and "Alone in the Wilderness". They sell their DVDs, video tapes, books and CDs from their website. 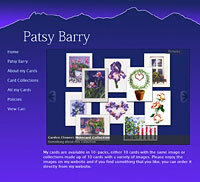 Patsy Barry, a popular watercolor painter from Fort Collins, creates notecards and holiday cards from her paintings and she sells them from her website. We recommend a WordPress based website design for customers that want to maintain their website themselves and don't want to learn programming, or if they want to blog on their website. These websites are quick and simple to create, but they can be harder to customize because they use themes to define the style. Pat is a local author and she uses her website to promote and sell her book, "Dance of the Electric Hummingbird". She blogs frequently to build a community of people interested in ideas that she writes about in her book. She selected the TwentyEleven theme because it is free and easy to customize. The Gluten Bootin' Bakery sells gluten free baked goods and baking mixes. They needed a website to make contact with retailers and to sell products directly to the public. 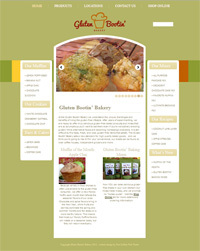 They chose the theme1387 theme because it had a nice slideshow on the home page and was oriented towards bakery websites. 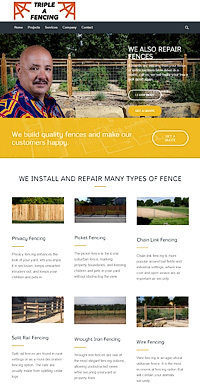 John at Triple A Fencing has been installing and repairing fences for over 20 years. He needed a website to help build his business so we created a responsive WordPress based website for him. Please contact John if you need a new fence or fence repairs. 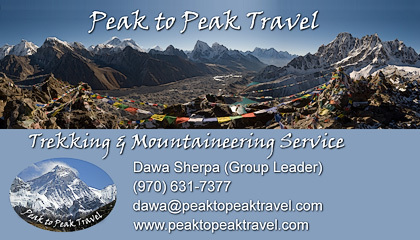 The Maya Sherpa Project is an organization that promotes cultural exchange between Nepal and the west. 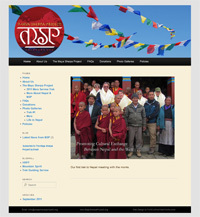 They wanted a simple website to display their pictures, describe what they are doing in Nepal and help raise money. We chose the TwentyEleven theme for this website because it is so easy to customize. 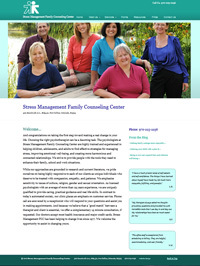 The Stress Management Family Counseling Center wanted a website to advertise their services and provide valuable information to the community. They chose the U-Design theme for their website because it has a nice slideshow on the home page and it is very flexible with color choices. If your inventory changes constantly, you can take your own product pictures, and you are comfortable making changes to your website you might want a website with user controlled inventory. These websites are more expensive to create initially because we have to create two websites one for your customers and another private one for you to use when updating your inventory. George Walbye is one of Loveland's more famous sculptors. 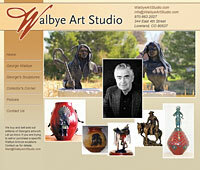 The Walbye Art Studio sells George Walbye's sculptures online. The availability of the sculptures changes constantly, so the studio wanted to be able to add and remove the sculptures themselves. 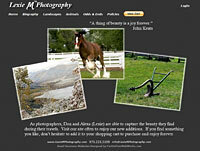 Don and Alexa of Lexie M Photography sell their images on cards, and as prints directly from their website. They decided to maintain their photographic inventory themselves because they are professional photographers and wanted to save money by adding their extensive photograph collection themselves. Sometimes you just want to give your customers something to hold in their hands. We will create paper brochures that you can have printed at Kinkos or your printer of choice. 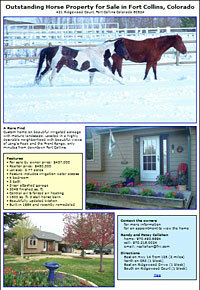 Here are a few examples of our brochures. 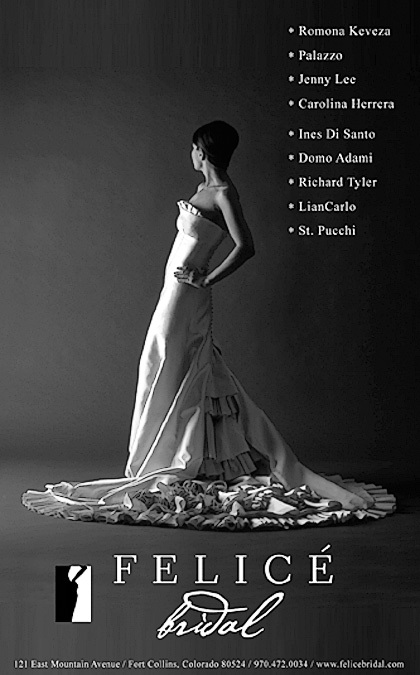 We will even work with the advertising department at your favorite magazine to create your ad using their specifications. 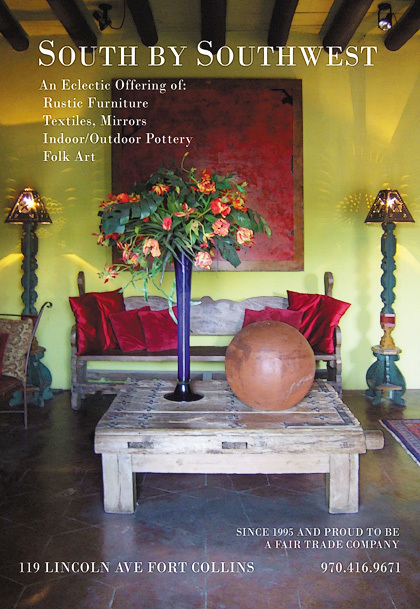 These are a few of the magazine ads we have created for our customers. When you change your branding you may want to change your business cards to match the style of your website. These are a couple business cards that we designed to match our customer's websites. Most of our customers already have logos when they come to us for their website designs, but we will design a logo if you need one.